We’ve never seen anything like it here! Four consecutive days, four different holidays, and four b’nai mitzvah. Throw in a baby naming and it adds up to something quite special here this weekend. This weekend’s Shabbat-O-Gram has been sponsored by the families of our four b’nai mitzvah and I also dedicate it in their honor: Ross Lang, Jonathan Rich, Adam Lee and Lauren Schechter. Mazal tov! All four students will join us tonight at our 6:30 Kabbalat Shabbat service OUTDOORS. It will be beautiful – dress is casual. Today is Jerusalem Day on the Hebrew calendar, marking the liberation of our holy city in 1967. 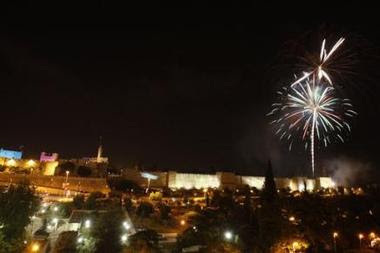 It was observed on Thursday in Israel to avoid conflict with Shabbat preparations (the photo above was taken last night in Jerusalem). See the following coverage: Jerusalem Day Becomes 'Stand Up To Obama Day'; read the address by PM Netanyahu on the occasion of Jerusalem Day, see also, from the IDF, Jerusalem Day: Remembering the Battle of Ammunition and Our Fallen Heroes, and read Rabbi Reuven Hammer’s interesting op-ed in the Jerusalem Post, Tradition Today: The meaning of Jerusalem. Also, see a slide show of yesterday’s events in Jerusalem, the pageantry and the politics and here for a beautiful slide presentation on Jerusalem. Click here for a map of the battle of Jerusalem and, last but not least, here to see video of the historic moment when the Israeli troops liberated the Western Wall. Shabbat is our most important holiday. Sure, it comes once a week, but that only increases its uniqueness. Why not take this opportunity to reintroduce yourself to Shabbat, called by Abraham Joshua Heschel a “Sanctuary in Time.” Read what he had to say about Shabbat here. Sunday we welcome the new month of Sivan. Read about this minor new moon festival known as Rosh Hodesh here and find out why it has long been looked upon as a woman’s holiday. We are a nation at war, and never more than in the past two days have we been reminded as to why. The attempted bombing of two Riverdale synagogues by extremists, who stopped off in Stamford to pick up their fake bombs, brought the war on terror close to home in more ways than one. This is a war unlike any we’ve ever engaged in before, requiring a resolve that few nations possess – thankfully the US and Israel both possess that resolve. We need it, because innocent civilians are now the prime targets, and many have been victimized. But, as different as these wars are from the “typical” wars of the past century, one thing remains the same: brave people in uniform face death every day and some of them do not come home alive. On Memorial Day, in between the barbecues and rides to the beach, I hope that each of us will take a moment to recall those who have made the supreme sacrifice. For a history of Memorial Day go to the History Channel website and to the official US Memorial Day site. So what links all of these celebrations and events? Each calls upon us to mark our significant passages in time and to make memory meaningful. Since we begin the book of Numbers tomorrow, let's put it in the form of an equation: 4+4+4 = Memory + Meaning. Who Cleans Up the Mess? Beth El's Sherry Cohen on "Frontline"
The Pope in Israel: Big News? Why do Jews Celebrate Lag B'Omer?